Students shall refer to DSA officer-in-charge for the booking. 1) Booking of Grand Hall/Grand Hall Foyer is only allow be booked SIX (6) months prior date of event proper by DSA officer-in-charge. 2) DSA officer-in-charge is required to write an email to DGS-KPR, DEF-KPR and DSS-KPR with justification and necessary information such as event and set-up dates, type of event, occupancy of total seating, the need to use the function rooms, etc. 3) After receiving the confirmation from DGS-KPR, DEF-KPR and DSS-KPR, DSA officer-in-charge need to obtain approval from the VP. 4) Upon obtaining approval from VP, DSA officer-in-charge need to apply on-line booking for the Grand Hall/Grand Hall Foyer and notify DGS-KPR. DGS-KPR has the right to withdraw the approved booking if any upcoming important events fall on the same date of your booked event. Officer-in-charged is required to refer to the Office of Vice President (Student Development and Alumni Relations) before sending student(s) to attend participate in any of the external events / activities which are not organized by our University. The University has the responsibility to ensure the safety of our students while engaging in external activities. Any student body wishes to cooperate with any other external organisation, they must get prior approval from the University. The use of power socket at S.P.1, S.P.II and Pathway between FSC and FEGT refer. ii) Location and Power Socket No. The attached form are required to fill up by applicant to ease the officer in-charge closely monitor and follow up. 2. DEF will turn on upon receiving request. A master copy of Floor Plan with Power Socket No. will be placed on Clubs & Societies Unit whiteboard for reference. Inactive students such as students who are under termination, Leave of absence are not allowed to represent UTAR for local, national/international competition/conference. Awareness - Having Knowledge; Public or common knowledge or understanding about a social, scientific, or other issue. BarCamp - A workshop-events and the topic and content is prepared by participants. e.g. Topics may vary such as health care, education, and others. Conference - A formal meeting of people with a shared interest, typically one that takes place over several days; A prearranged meeting for consultation or exchange of information or discussion (especially one with a formal agenda). Competition - A contest in which a winner is selected from among two or more entrants. Carnival - A traveling amusement show, having sideshows, it is centered around rides. etc. Wellness - An approach to healthcare that emphasizes preventing illness and prolonging life, as opposed to emphasizing treating diseases. e.g. Craft fair, Book fair, Job Fair. Fair can have buying, selling, trade, amusement, food and other entertainment. Festival - An occassion for feasting or celebration, especially a day or time of religious significance that recurs at regular intervals; An often regularly recurring program of cultural performances, exhibitions or competitions. Flea Market - A market, usually outdoors, where antiques, used household goods, and curios are sold; A type of bazaar that rents space to people who want to sell or barter merchandise. Seminar - A lecture of presentation delivered to an audience on a particular topic or set of topics that are educational in nature. Symposium - A Symposium is typically a more formal or academic gathering, featuring multiple experts delivering short presentations on a particular topic. Symposium is meeting of a number of experts in a particular field at which papers are presented by specialists on particular subjects and discussed with a view to making recommendations concerning the problems under discussion. Training - Teaching or developing in oneself or others, any skills and knowledge that relate to specific useful competencies. Workshop - A brief intensive course, a seminar or a series of meetings emphasizing interaction and exchange of information among a usually a small number of participants; A series of educational and work sessions. Purpose for workshops may vary. e.g. Informing, problem solving, training. Please seek an advice from your staff in-charge of activities that need to use the water hose so that the staff in-charge will to obtain permission from DGS-KPR before they use it and not to spoil the water hose. If it is found that the damage was caused by the students, they are responsible to replace it. Starting from now on, if there is any campus overnight activities, pls send inform DEF as well. Just informed by DEF that they have installed timer which the electricity of the campus will be cut off after 11pm. So in future, any overnight activities which require electricity, pls inform DEF by sending service request. Please use the short form in reports for meeting. The guideline/information to your society adviser/co-adviser for their reference, especially the new appointment and work closely with them. Starting from now on, if you wish to book a box van, kindly submit the booking to DGS at least 1 month ahead. Once the event date was confirmed, pleasse plan/coordinate accordingly with the committee involved, to avoid any cancellation. Anyway, booking priority will be given to those university event, so please always follow up with DGS after you submitted the booking form to them. If any event, the student society inviting external party to participate, example, the flea market, pls ask the committee to inform those parties, they have to abide our rules and regulation, like dress code and also parking. If they simply park and clamped by DSS, then they have to pay the fine as well. There will be no soft skills point for helpers in Recruitment Drive. 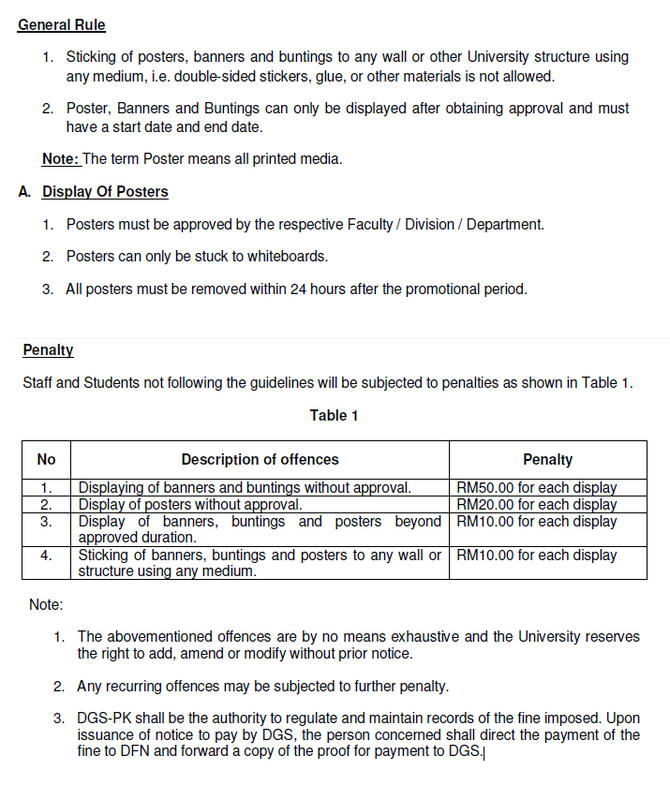 Do not place any posters/notices without approval at any non-designated area, e.g. pillar, window, door & wall. Please submit the application form to DSA officer-in-charge for approval. Read and understand the terms and conditions. Any programmes involving the Perak State Govt, in line with their policy, no souvenirs to be given. For example, if you have an EXCO coming to your event, no souvenirs to be given to them for coming to your event as VIP. In line with this practice, the same should be the same for the UTAR management. No souvenirs to be given to President or Vice President or whoever as GOH for an event. All invitation letter must be sent out at least 1 month ahead, if the invitation is extended to external party and it sent out through President, please do it at least 2 months ahead. Deadline is required to be set by org. committee to respective DSA officer-in-charge. For the proposal which sent in last minute, NO need to invite any VIP/guest. Moreover, all the invitation letter either in email format/hard copy, pls ask the committee to show to DSA officer first before sending out. Income statement of any event must be submitted within 1 week prior the event ends. As we know, our world is facing many challenges in term of energy. To make our world better for our future generation we should not waste any kind energy. Do activity in"green" way, do not waste any energy, especially water and electricity. Advance money is to be applied before the event. The organising committee just can claim the expenses of an event based on the income statement of the event. Other word, the claim just can be made after the submission of income statement. Started from next trimester May 2014, all the transportation claim has to be based on mileage, example how many km x RM0.40. Pls do not allow to claim a whole lump sum or based on petrol receipt. Please those receipts on A4 paper if those receipts are smaller than A5 paper(half of A4 paper) only. Invitation of speakers by Faculty, Dean has to be responsible and sign the letter. For invitation to VIP who are politicians/MP's/Deputy Minister and Minister, please write through President and the letter must be written that. This includes sourcing for sponsorship etc. No more external parties to direct contact the President without acknowledgement. Just to remind you all that, if any societies/clubs organise off campus activities, pls ensure that they fill up the indemnity form and return to DSA before the event. It same to off campus activities organised by Counselling and Guidance Unit. pls ensure this applied to all external competitions as well. 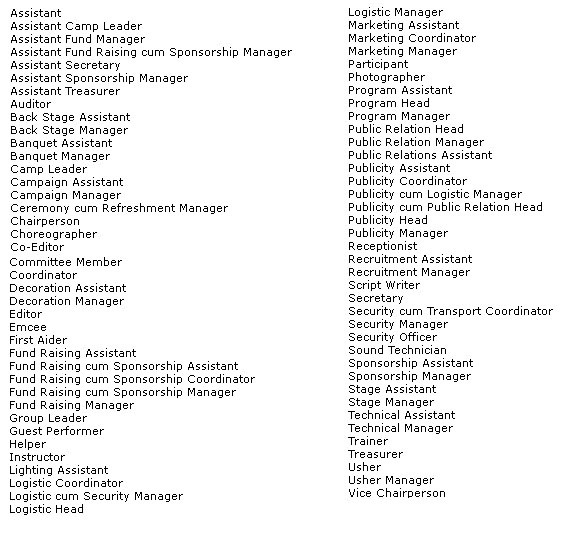 Follow and choose the name of the position according to the list below. Do not use any other names that is not listed in this menu. If you invited President/Vice President/Representative to your event, please inform the Officer-in-charge to request for assistance from DCCPR to prepare President Speech. Please specify what you would like from DCCPR and when is the event? Is this a speech for the President? Please inform the officer-in-charge least 3 weeks to prepare before the event date. DCCPR requires 2 weeks times to prepare the speech. Who are the audience and other guests? Any awards/significant matters for president to mention? We need these info to prepare a relevant and proper speech. Dated on: 10/7/13, 3.17 P.M.
President instruction that all official functions on the night to start earliest at 745 pm (earliest) from now on, irregardless of whatever. This is to teach our students to be aware of Muslim's prayer time about 7pm. Please use the official names of the university building correctly, especially when you are preparing for your society proposal, sponsorship letter poster or any other documents. Students should not use names like Block A, B, C or D but the names such as Heritage Hall, Learning Complex I, Student Pavillion I and others. All printed materials prepared by any societies must be checked by language lecturer and DSA officer-in-charge. No error/mistake shall be found in any printed materials. Do not place any flyers on car's windscreen. If you wish your activity to reach students and staff, we can help you to put it on website or make announcement in intranet. Dress Code for External Parties that involved in Clubs & Societies Events. If any of our student activity involved external party and they have to enter our campus, please ensure that the external party always follow our dress code. -- if the fine is paid by committee members, it is also need to minute in their weekly / monthly meetings. Wish to inform you all that, our Dewan Tun Dr. Ling Liong Sik(Grand Hall) can be booked for student activity. To book the hall, the activity proposal have to forward to Dr Teh for his perusal. Once he give the green light, the respective officer in-charge for the society, can make the request online via web2. If any society wish to use the Grand Hall, they must really plan ahead, no last minute request(must folow our guidelines). Fyi, the capacity of the Grand Hall is about 3500pax. Just encourage those activity has such crowd to apply to use the hall. If any of you who is Alumni now and involved in our student activities, Please inform us (05-46888 88; extension: 2282). DARP needs the info to compile for SETARA rating. Please be reminded once again that the protocol for opening ceremony would be the VIP who is to open the event should speak last. We will take control of the glow of events snd ensure this is disseminated to ALL SRC, clubs and societies. All itinerary would be scrutinized by DSA and ensure this is followed. i) Cooking is strictly prohibited in any clubs & societies activities and events including all types of sponsors (Vendors, suppliers, manufacturers, agents & students and staff). No domestic gas, pot, pan, BBQ grill is allowed to bring into the campus. ii) Do not use any sockets found inside the cafeteria's kitchen/counter for your activities/event usage. If your society or club's event/activity involved external organisation like sponsor, guest or speaker to enter the UTAR campus, please give the details of those person to DSA, like name, car plate number, details of the event and etc 3 days in advance. Without prior notice, DSS can always reject them to enter the campus, this is for safety reason. (i) Second reminder: For opening ceremonies, the chair of the person is to give its opening or welcome speech first. The GOH (Guest of Honour) is to speak last. THEN, the GOH to give its opening speech. In other words, the GOH opening speech is always the last. (ii) President raised the issue of dress code. (b) ALL students who participate in competitions (NOT sports competitions), but competitions such as quizzes, etc are to wear APPROPRIATELY. NO mini skirts, shorts, sllippers, etc. - All notices MUST be approved and stamped the expiry date by the respective officer-in-charge before placing any signages on board. - The student body/club concerned will be asked to remove any notices/signages on the event if is not removed after the expired date. - No delay on removing banners and buntings. Once the event is finished, the organising committee MUST remove all the promotion materials immediately. Do help us to keep our Kamapr Campus neat and tidy. Any students who wants to stay back in campus until late night for event purpose, please inform officer-in-charge in advance. This is for the safety and security concern. We need to keep the new mobile board in a safe place or else it will be easily being damaged by a heavy rain. If any clubs/societies who had finished using their mobile board, pls keep our cafeteria in Block C clean by removing all the decoration poster/flyer/sugar paper and disposing them accordingly.